That person who does more than get to know you, your business, and your client avatar, but who can really SEE you. Like deep down, into your truth, even when you can’t. The person who can remind you of your greatness when times are tough… and let’s be honest: sometimes the entrepreneurial road can be a little bit rocky. Well sweet one, I’ve got some pom poms, a cheery disposition, and a can-do attitude. Though I should warn you: I’ve been known to drop an eff-bomb or fifty. What type of magic do you create? It gets all sorts of answers…. From the well defined (“I help women reclaim their power.”) to the abstract (“I coax out a person’s inner unicorn.”) How this question gets answered tells me a lot about a person. I reach into your heart to tell the story your soul yearns to share. I weave that story into your brand to help you show up fully, and authentically, in your life, and your business. 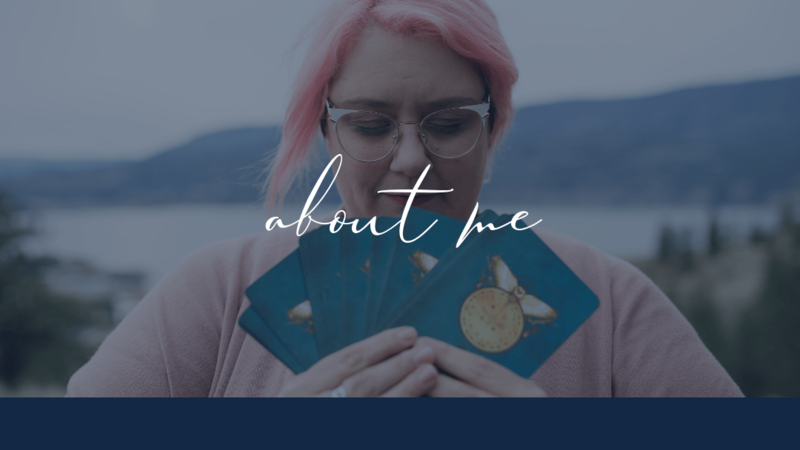 I co-create with your angels, guides, and Akashic Records to make something so aligned, so precious, that you have the confidence to claim your leadership and to make impact on those around you. I create safe spaces for honest conversations. My super power is helping you to honestly express your heart’s desire. We then use this information to help you create a life and a business that lights you all the way up. The insight I receive helps you to create a life with purpose, on purpose, which gives you permission to say more yeses to everything you desire, and more nos to the stuff that’s in the way. I touch a few lives, who touch a few lives, who touch a few… And together, we’re starting a revolution. Long hours. Bad coffee. Competing demands. One company I worked for’s unofficial motto was “Right away and all at once.” Despite the bad stuff, I’m grateful for the time because it showed me what I’m made of. Every job I’ve had was in a sink-or-swim environment, and I never let the waves overtake me. I learned that I have a hidden resilience that showed up every time I felt a flicker of doubt or overwhelm. I learned how to manage high end clients and a million+ dollar sales quota, how to brand with the best of them, and how to be rewarded with money, gifts, and travel for my hustle. I learned to listen to my inner knowing, my body’s rhythms, and how to rally support for all the things I’m not great at (or that I just plain don’t like). I learned I have an insatiable desire for MORE, which has lead to a lifetime commitment to personal and professional development. I’m trained in broadcasting, relationship marketing, neurofeedback, aromatherapy, oracle card reading, mediumship, and am a certified Angel Guide (Kyle Gray) and Akashic Records Consultant (Soul Journeys Method). I am ALL IN when it comes to lightwork, expansion, and the elevation of our collective consciousness. I believe that anything is possible. I’m living proof. If you’d told me as a kid growing up in city housing on social assistance that I’d be flown to the Four Seasons in Costa Rica by one of the biggest companies in the world because I’d made them over a million dollars, I would have called you a liar. Full stop. This isn’t one of those gag-worthy, rags-to-riches stories. This is me telling you that I get it. Being an entrepreneur is inner work. My corporate sales success didn’t prepare me for that. I had no idea how many of my old stories I’d need to overcome just to keep myself from having to work for someone else. If not for my relationship with Spirit (which started intuitively on the playground, and rekindled in my late 20s), I’d be another statistic of someone with big dreams who relied on someone else for a paycheque. I’ve been there. I know what it’s like to feel unclear about my purpose, and to work for the weekend, (though I’m proud to say I’ve never uttered the words Fri-Yay!). I remember being unable to invest in my business and wasting so much time reading through people’s freebies, many of which contradicted each other, instead of serving my people. I remember doubting my gifts (the business ones, and the intuitive ones), and wondering if anyone would ever pay me for them. And to this day, I still get slapped with anxiety and the flu every time I uplevel. So believe me when I tell you: I get it. Today, I aspire to live my life in a way that is an example of what’s possible. I’m just one woman — there is nothing particularly special about me or my journey. But I keep showing up. I keep doing the work. I keep trying. I don’t give up. I cry, I hustle, I fall, I get up. And if I can… you can. My commitment to you is that I will always share openly, and transparently, even when it hurts. I won’t fill you with false hope and promises, but I promise to see you, and meet you where you are so we can rise together. We will talk, and laugh, and explore. We’ll work our butts off and find the truest truth that feels wholly aligned for you, and totally magnetic for your dream clients. We’ll co-create some magic together, and it’s going to feel amazing. Seryna Myers is a Sacred Soul™ Mentor who helps women tap into the power of their stories to release their barriers to visibility, and to infuse more of themselves into their brands, trickling into their daily lives. She believes authenticity is the key to heart-centred business, and that marketing can be done with integrity when you put the focus on relationship building. Seryna has overcome corporate boredom, burn out, and the desire to blend in. 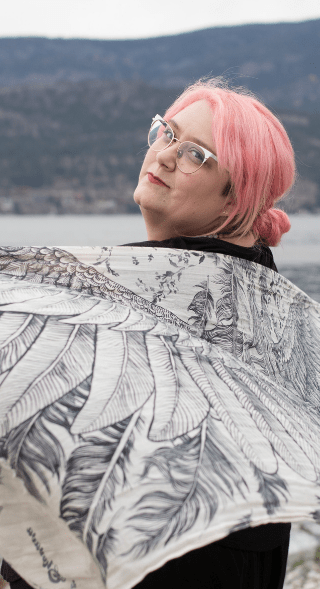 She’s obsessed with pink, is part mermaid, and makes her home in beautiful Vancouver, British Columbia Canada.